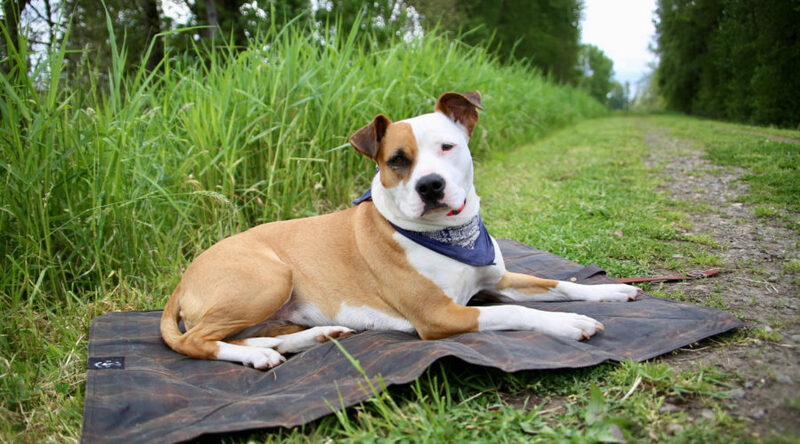 Keep your pup off the cold ground with the durable but comfortable Oregon Tails #Adventuredog Bed Roll, which clips into a compact bundle for easy packability. 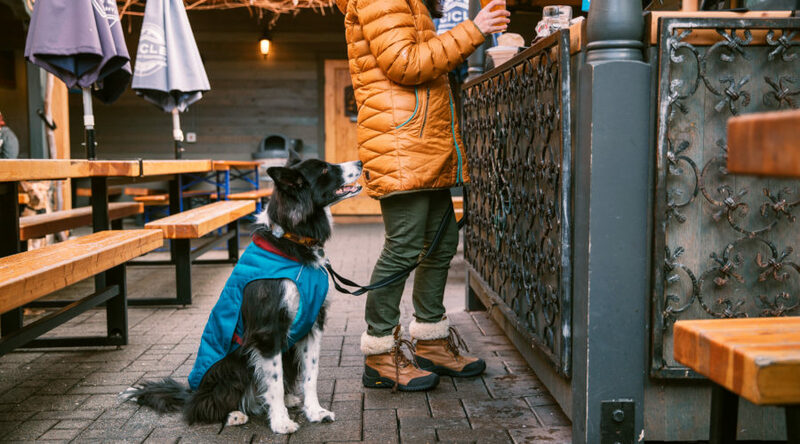 The new quilted Ruffwear Stumptown Jacket is a colorful, stylish way to beat the chill. 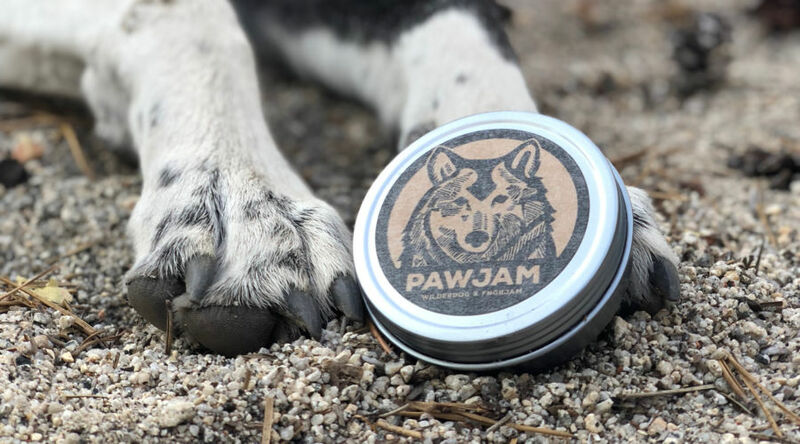 End the day with some beeswax-based Wilderdog Pawjam balm for rough, tired paw pads. 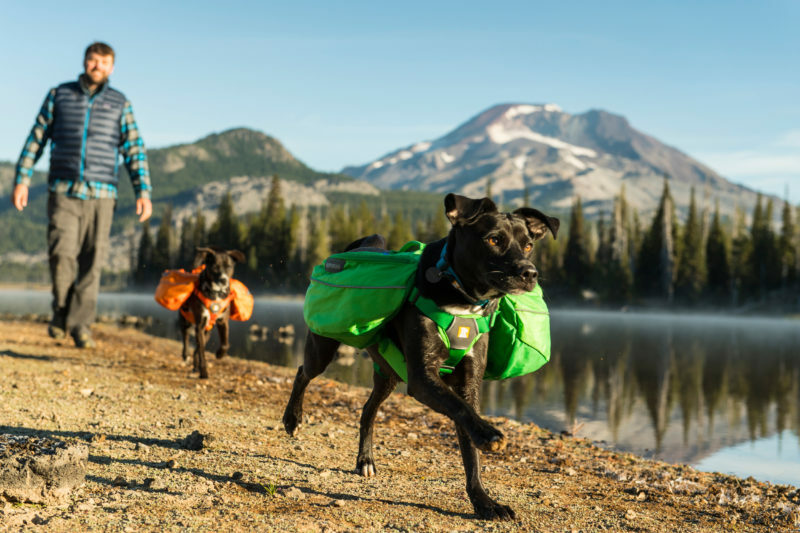 With this dog backpack, your best trail buddy can lend you a hand with the gear load. It has a harness-style fit for stability and comfort, two places to attach a leash, and dual stash pockets. This is a pack any dog would be proud to carry! You wouldn’t leave for a camping trip without packing your raincoat, and you should take the same precaution with your pooch. 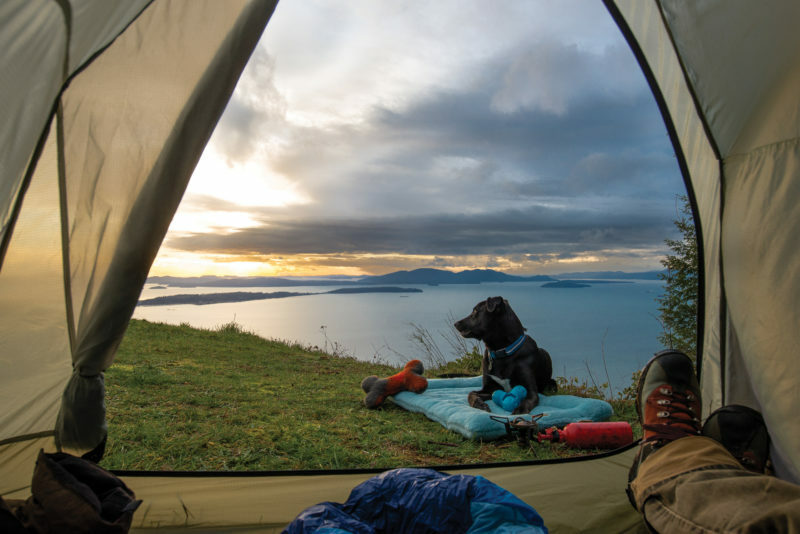 Lightweight and breathable, this L.L.Bean rain jacket will keep your dog comfortable in wet weather and windy conditions—and minimize that overwhelming wet dog smell when you all pile in the tent at night. 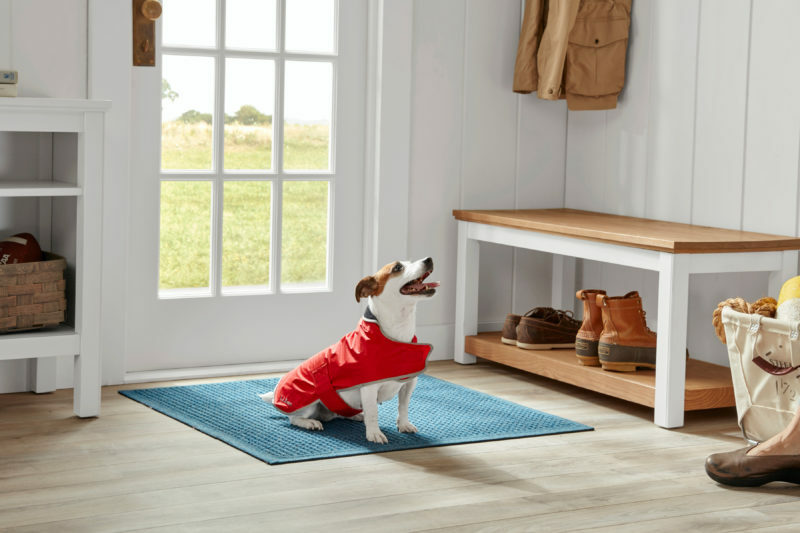 Bonus: Your pup can use it any time there’s inclement weather. You probably have a favorite duffle or rucksack that you hardly bother to unpack during the camping season. The K9 Cube is exactly that, but for your dog. 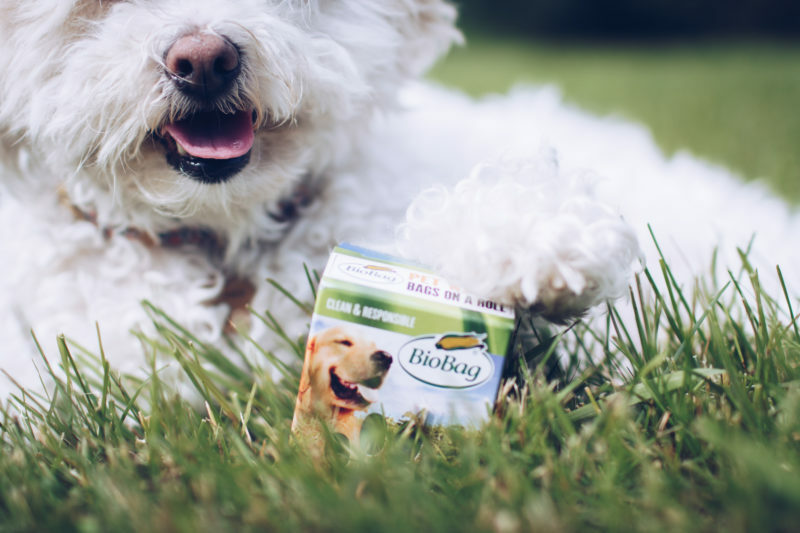 It has generous pockets to keep everything your dog needs—toys, food, first-aid essentials—organized and easy to find. 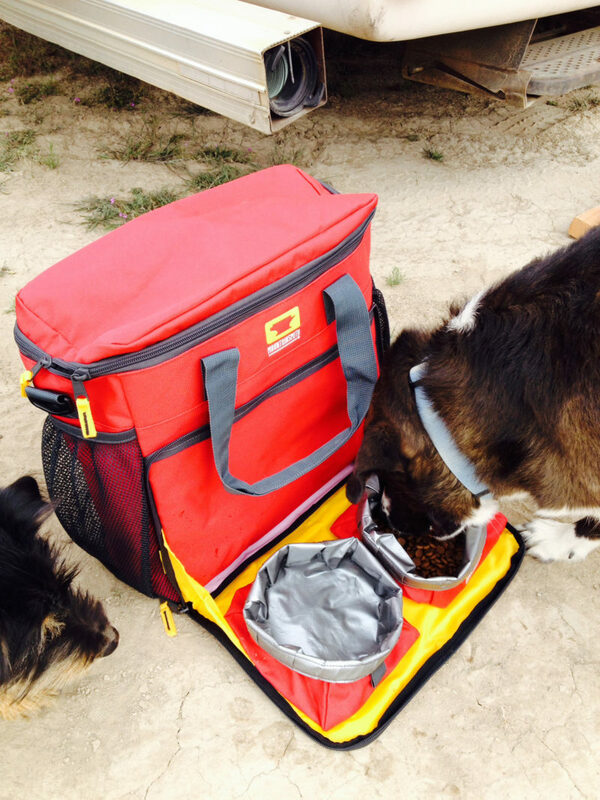 The front panel zips open for a drop-down food tray that’s perfect for pit stops. 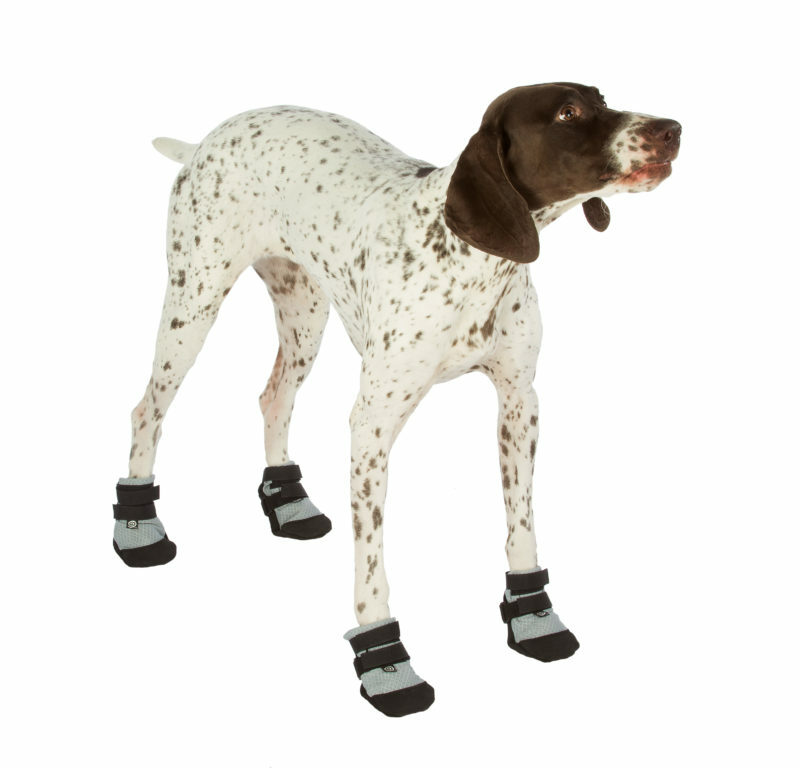 For rough trails or hot pavement, your dog needs foot protection just like you do. The Ultra Cool dog boots are perfect for summer adventures because they’re designed to deflect heat away from your dog’s paws, especially when walking on hot surfaces like concrete, sand, or a boat deck. The boot has a breathable mesh upper with reflective foil to deflect the sun’s rays and a tough recycled rubber sole. These collapsible travel food and water bowls are essential for trips with your pooch. The silicone is nontoxic, flexible, and easy to clean. Slip a few bowls easily into your backpack—or your dog’s!—or clip them to the outside with the convenient carabiner. Your dog will love this soft bed as much as you love your trusty down mummy bag. It’s sturdy but lightweight, making it great for travel and camping. It’s handmade with eco-friendly fibers in a large variety of colors and filled with material made from recycled plastic bottles. 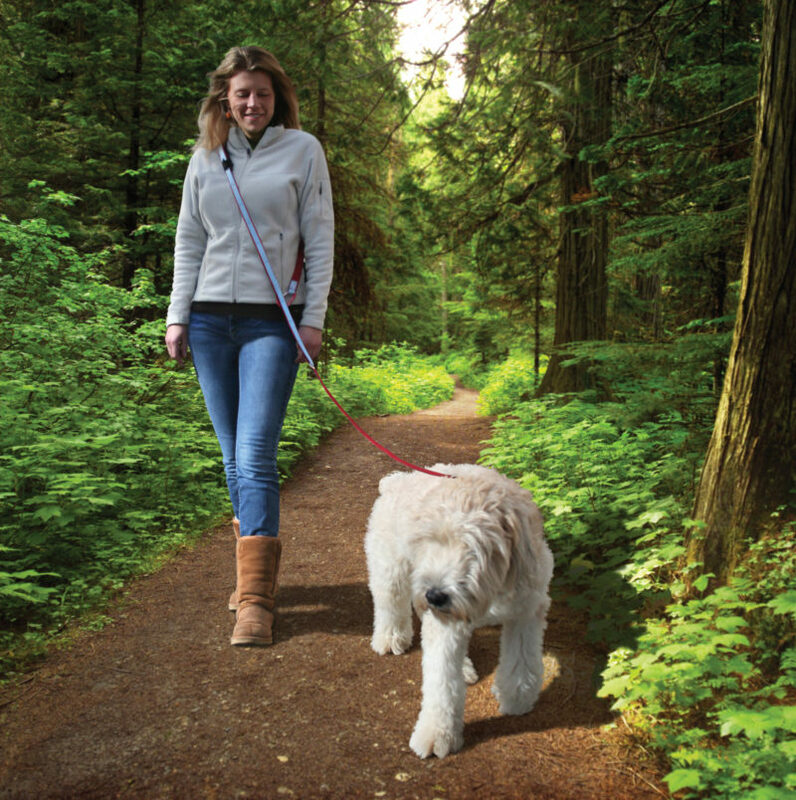 For hiking or trail running with your pooch, it’s nice to have a comfortable hands-free leash. The Kurgo Quantum leash converts into six different styles, including around-the-waist and over-the-shoulder. It has reflective trim for safety and is made from durable nylon. There’s also an extra handle in case you need to pull your dog back quickly. 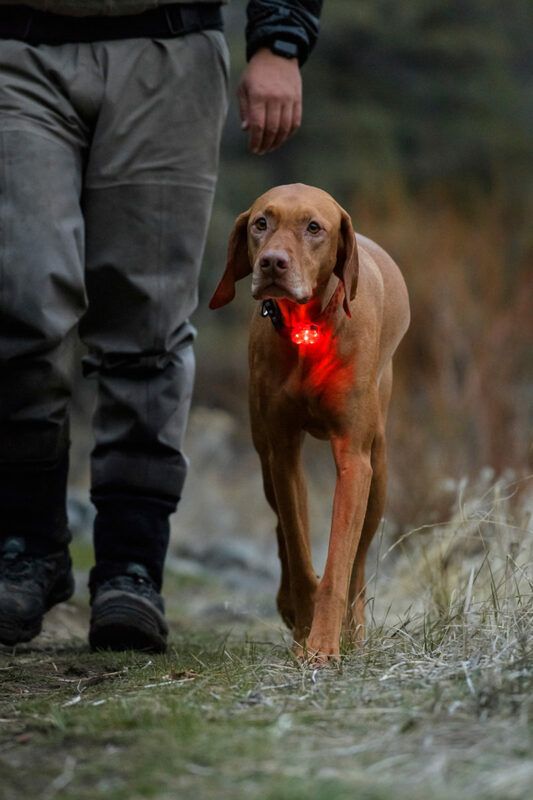 Keep Fido safe during evening hikes, bad weather, and nighttime bathroom breaks with this waterproof safety light that clips easily to his collar or harness. You’ll be able to see where he is at all times and so will everyone else. The battery is rechargeable and has three light color settings: blue, red, and green. Be a courteous camper and pick up the poop. But instead of trashing a ton of plastic baggies, which isn’t very kind to Mother Nature, pick up a pack of biodegradable BioBags. They’re made with plant materials and vegetable oils so they completely break down in the landfill. 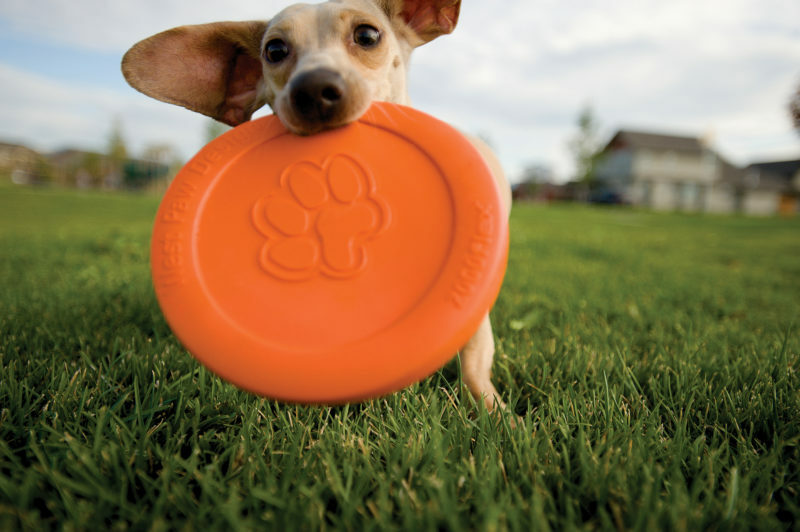 Frisbee is a classic campground pastime, and now your pup can get in on the action with the soft, tooth-friendly Flying Zisc. 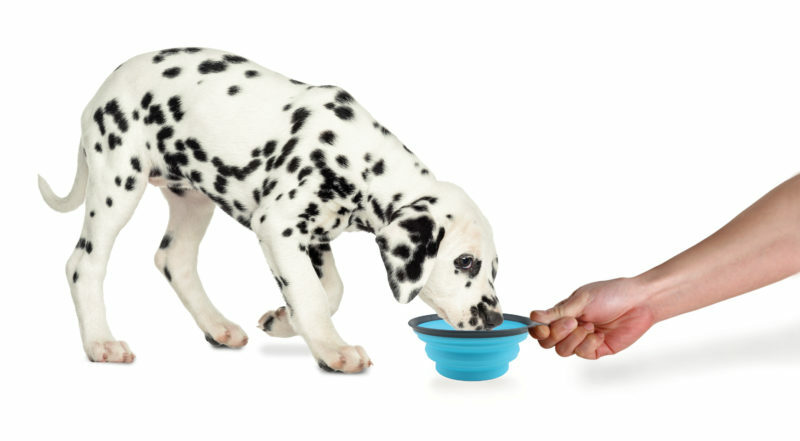 It’s nontoxic to chewers and can even be used as a water bowl in a pinch if you flip it upside down.